Prepare to die again on October 26th. 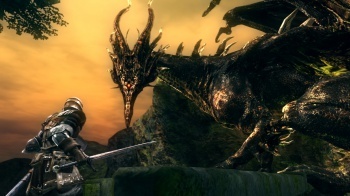 If you were planning on picking up Dark Souls for the 360 or PS3, you might want to wait a little longer. The Prepare to Die Edition of the game just released on PC will be hitting consoles on October 26th, complete with the Artorias of the Abyss add-on content. The extra content will also be available as paid DLC for those of you who've already dropped cash on the original release. The Artorias DLC introduces new areas, equipment and monsters, and is around 10 hours long according to producer, Daisuke Uchiyama. It'll also introduce PVP matchmaking, add a few more checkpoints to the game world and cost $14.99. According to reports, the PC version of the game is very much a mixed bag. It's still the same rewarding but brutally punishing game that delighted and infuriated console gamers last year, but it's also one of the worst ports in recent memory. The internal resolution is knackered (though easily fixed, apparently), a gamepad is an absolute necessity, it uses the ever-unpopular Games For Windows Live and the action is hard-capped at 30FPS. That being said, you can't argue that From Software didn't warn us that this would be the case, and the fact the game made it PC at all does prove that internet petitions aren't entirely useless.